In the world of klezmer music, Alicia Svigals is a household name. 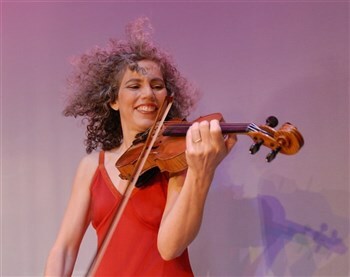 Ever since her band The Klezmatics came on the scene in 1986 with its unique take on traditional klezmer music (she remained a member until 2002), Alicia has been the go-to person for klezmer fiddle. Since her departure from the band, she has put her stamp on numerous musical projects. She has worked with talent as varied as classical violinist Itzhak Perlman to Led Zeppelin members Robert Plant and Jimmy Page. Her performaces have appeared on A Prarie Home Companion, The Late Show with David Letterman, and Showtime’s The L Word. So it would seem inevitable for Alicia to delve into composing music for a film soundtrack. However, her first major soundtrack work is not your ordinary modern-day movie. Enter The Yellow Ticket. This 1918 Polish-German silent film tells the tale of a young Jewish girl in Warsaw (portrayed by Pola Negri) who plans to attend medical school in Moscow. She learns that a single Jewish woman can only live in that city if she is registered as a woman of “unclean virtues,” and her citizen paper is then referred to as the yellow ticket. She locates a birth certificate of a friend’s deceased sister and uses it to enter medical school. The plot contains plenty of melodrama popular with films of the era, and is one of the first films to show the heavy anti-Semitism rampant in Tsarist Russia at the time. A trailer for the film The Yellow Ticket can be found at www.youtube.com/watch?v=P-w75T7RMPg . There are many videos of Alicia on YouTube, including an excellent “Masterclass” series from The Strad magazine, in which Alicia teaches running semiquavers, the zhok, krekhts, slides, bends, and trills. Lesson 1: www.youtube.com/watch?v=muvjcMTX9Xw. For more information on Alicia Svigals and her recent work, visit www.aliciasvigals.com/ .